Goulash is a typical recipe from Hungary, and it is really a masterpiece. 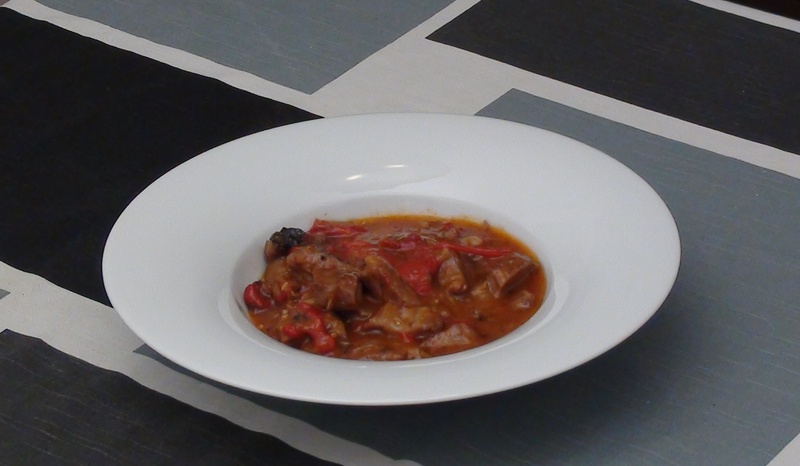 At least here hungarian gastronomy does not have a powerful marketing as other gastronomies, but if there are more recipes like this Goulash, it will sure worth to take a lookt to it. Start removing the fat from beef, choose a beef with a minimum thickness of 2 cms, cut the beef in cubes of about 4 or 5 cms. Add a bit of salt and ground pepper on the beef. In a dish put a bit of flour put the pieces of beef on it and then remove the excess. Cut the onion onto stripes, and then loosely cut the stripes, don’t worry we don’t need it to be chopped. Chop 3 garlic cloves. Grate 2 tomatoes, in order to grate them easily cut in half and then just grate until it remains only the skin. Lastly cut a red pepper onto stripes, then the stripes on half. In a pot add previosly cook beef, the red pepper and the pan content. Mix it well and cover the pot with a lid. Cook with low fire for about one hour and half and 2 hours, until the sauce becomes dense. Be sure to have enough bread when eating this delicious recipe.